#2514 on the 505 along Atlantic Avenue in Atlantic City. New Jersey Transit operates the following local bus routes within Atlantic County, centered on Atlantic City that were once operated by Atlantic City Transportation Company. All of these routes are exact fare lines (except for 510) and are operated out of the Egg Harbor garage. The full route is shown below except for branching. School routes are not listed. Sunday service ends at Hamilton Mall in Mays Landing and does not serve Atlantic Cape. Select service travels via Ventnor Plaza. More frequent service to Venice Park. Between 9:30 AM and 3:30 PM daily, 509 trips are extended into Ocean City. These trips also operate via the Black Horse Pike instead of the Atlantic City Expressway. Former 316 Local service between Wildwood and Cape May, split in 2011. Rerouted to operate via Route 9 in 2016. In the past, New Jersey Transit ran shuttle routes running from the Atlantic City Rail Terminal to casinos in Atlantic City, numbered 506 and 510-513, connecting Atlantic City Line customers to casino destinations. 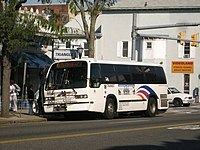 All of these routes are now operated by the Atlantic City Jitney Association using either jitneys or dedicated minibuses. Note: Destinations indicated in chart below reflect names of casinos at the time of the ACJA takeover in the mid-1990s.